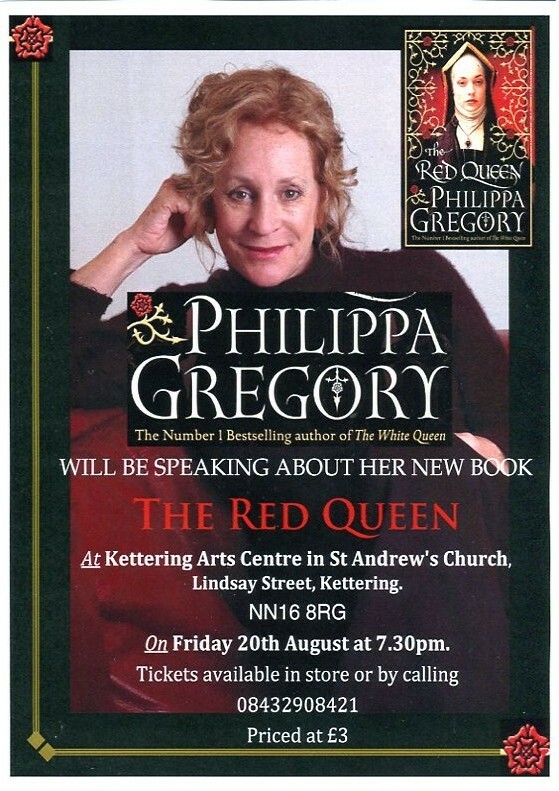 Phillipa Gregory, best-selling author of historical novels including “The Other Boleyn Girl” (recently made into a film starring Scarlett Johansson and Natalie Portman) and “The White Queen”, visits Kettering Arts Centre as part of her week of events to launch “The Red Queen” the story of Margaret Beaufort, mother of King Henry VII (and one time resident of nearby Collyweston, where our church roof slates come from). Talk followed by book signing. Friday 20th August 2010, 7.30pm (doors 7.00pm). Tickets are priced at £3 and available exclusively from Waterstone’s, High Street, Kettering, or by calling 0843 2908421. We expect this event to be a sell-out and recommend that you buy tickets in advance as we cannot guarantee that you will be able to buy on the door. The second book in Philippa’s stunning new trilogy, The Cousins War, brings to life the story of Margaret Beaufort, a shadowy and mysterious character in the first book of the series – The White Queen – but who now takes centre stage in the bitter struggle of The War of the Roses. The Red Queen tells the story of the child-bride of Edmund Tudor, who, although widowed in her early teens, uses her determination of character and wily plotting to infiltrate the house of York under the guise of loyal friend and servant, undermine the support for Richard III and ultimately ensure that her only son, Henry Tudor, triumphs as King of England. Through collaboration with the dowager Queen Elizabeth Woodville, Margaret agrees a betrothal between Henry and Elizabeth’s daughter, thereby uniting the families and resolving the Cousins War once and for all by founding of the Tudor dynasty.